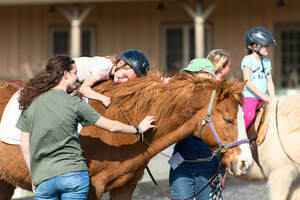 Our Therapeutic Riding program is designed to meet the specific needs of each participant. The prescribed program may include grooming, saddling, and learning riding skills or may be passive in nature. With some riders we position them so the movement of the horse can relax tight muscles, increase range of motion, improve trunk stability, and balance. These individuals are not learning riding skills but they are reaping great benefits just from being on the horse. 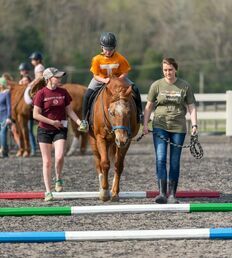 30 minutes of ground work which includes grooming, tacking, and mounting and 30 minutes of mounted work which includes exercises, riding skills, and games/activities. The groundwork part of the lesson is vital for maximizing the therapeutic benefits of the program. Not only is this where the rider experiences responsibility and discipline, but also the satisfaction that comes with caring for another living being. Grooming and tacking (putting the saddle and equipment on) are an integral part of the program that addresses the following developmental areas: fine and gross motor skills, spatial awareness, vocabulary, motor planning, sequencing, memory, endurance, attention span, hand/eye coordination, bilateral involvement, balance, crossing mid-line and muscle strengthening. The mounted segment of the lesson includes exercises, riding skills and games. Being astride a horse challenges the rider in these areas: balance, coordination, fine and gross motor skills, right and left handedness, motor planning, sequencing, communication, body awareness, muscle strength, flexibility, vestibular stimulation, teamwork, socialization, and self-esteem. Periodic trail rides are taken by those capable of experiencing the "ups and downs" of horseback riding and the true recreational capacity of this activity. Balance, coordination and muscle tone improve through exercises done on horseback. Psychological benefits include increased independence, motivation and self-control. 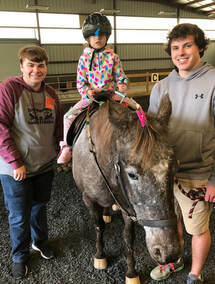 Vocabulary development and sequential learning contribute to cognitive gains, and self-esteem soars as the riders learn to control their mounts. The recreational aspect of STAR's program proves invaluable for these special persons who normally cannot participate in conventional sports. One goal at STAR is to enable our riders to become as independent as possible and to challenge them to retain and use what they learn. Competition gives them that opportunity. It also allows them to show off! STAR riders participate in a horse show annually. Some riders must forgo the ground work due to limitations. They ride for 20-30 minutes as they can tolerate. Activities while mounted are geared to stretching, reaching and engaging in a positive manner. Lessons are 1 hour a week at the same day and time each week for 1 session (6-10 weeks). All riders start their first lesson with 1 horse leader and 2 side walkers with the goal of being as independent as possible. Private 30 minute lessons are an option for a rider who may need more one-on-one attention or can not tolerate a one hour lesson. Lessons are groups of 4 riders who are similar in age, cognitive level, and skill level. All lessons are taught by a PATH Intl. Certified Therapeutic Riding Instructor. Group lessons are $40 a lesson, scholarship opportunities are available. All potential riders are placed on a waiting list until an appropriate spot becomes available. 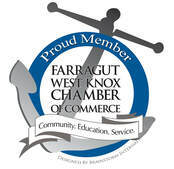 Call our office today (865-988-4711) to complete an intake over the phone to be placed on the waiting list.